In the world's literature, over 640 laparoscopic radical nephrectomies have been reported to date. The standard transperitoneal approach is the most commonly used technique, followed by hand-assisted, and lastly the retroperitoneoscopic method. Among the studies that have analyzed the operative results of laparoscopic radical nephrectomy (16-25), aEthicon Inc., Cincinnati, OH. bApplied Medical Resources, Rancho Santa Margarita, CA. a55 transperitoneal, 3 retroperitoneal, and 3 combined transperitoneal and retroperitoneal laparoscopic radical nephrectomies. b52 transperitoneal and 12 retroperitoneal laparoscopic radical nephrectomies. c66 transperitoneal and 1 retroperitoneal laparoscopic radical nephrectomies. d177 transperitoneal and 18 retroperitoneal laparoscopic radical nephrectomies. 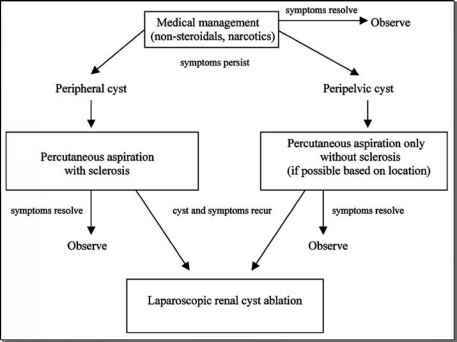 eAll retroperitoneal laparoscopic radical nephrectomies. f15 transperitoneal, 18 hand-assisted laparoscopic radical nephrectomies. gConversion done electively for tumor extension into renal hilum. Table 2 summarizes the six studies that compared the results of laparoscopic radical nephrectomy with those of contemporary series of open radical nephrectomy. The time to convalescence for laparoscopy ranged from 23 to 25 days whereas that of the open procedure ranged from 57 to 59 days. The conversion rate to an open procedure was 1.5% to 3.6%. The cosmetic advantage of laparoscopy is also evident as it was recently reported that a flank bulge following a standard flank incision was detected in almost 50% of patients (26).